Microsoft Office for Mac 2011 goes on sale today and Mac users should be pleased with the upgrades and the way it works seamlessly with Microsoft Office 2010 for Windows. You can finally say goodbye to those annoying incompatibility notices. And, as a someone who works primarily on Windows PCs, I found the transition to Microsoft Office for Mac to be very intuitive. It still is a little buggy in places, and there are a couple of key features—such as Outlook syncing with Google Calendar and contacts and live preview in Word—that are not in the Mac version. But if you're someone who needs to use a Windows PC at work and a Mac at home, or are looking to make the switch from Windows to Mac, Office for Mac 2011 will be a great purchase. The first thing you’ll notice when you open any Office program is what Microsoft calls the Ribbon, a thick menu bar with tabs that organizes all of the programs features and options. For people used to traditional menus it appears bulky and unwieldy, but you can click to shrink it and it takes a surprisingly short amount of time to master. Plus you can customize the Ribbon to your liking or opt out entirely in favor of traditional menus. 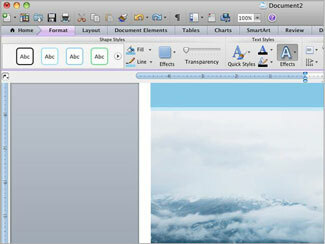 Working on a project or document with whomever and wherever is easy with Microsoft Office: Mac 2011. First, you can work with other Mac and Windows users in real-time on one document—as long as it’s saved to someone’s free SkyDrive account (which comes free with all Windows Live accounts) or is stored on a Microsoft SharePoint server (you’ll know if your company has one). You can see who the active list of coauthors and view their changes when update occur. 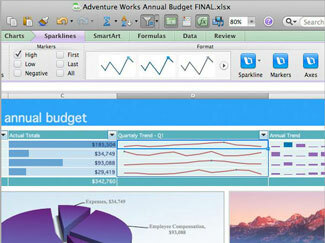 Second, you can work on your Word, Excel and PowerPoint documents on any computer with a Web browser and Internet access. Simply log into your SkyDrive account and make use of the free Web App version of the program. You won’t get all the bells and whistles, but all of the basic functionality is there. Supported browsers include Safari and Firefox on Mac and Internet Explorer, Safari and Firefox on Windows. Concentrate on your document in full-screen view—minimizing all the menus and making your desktop and all its distractions disappear. This view is especially helpful for reading documents. Word has had great editing tools for creating great custom layouts, but sometimes it’s hard to see how all those layers fit together. The new reorder object view lets you see each layer from the side so you can easily manage how it all comes together. Plus you’ll still have tons of templates to choose from and image editing right in the document. Word doesn't let you preview fonts and other formatting changes as you scroll through the list, as you can on Office 2010 for Windows, and it's a little buggy. For instance, the font color box was blank at one point, though you could blindly click in it and the color would change. It fixed itself after a restart. Whether you want to be able to stand back and read your notes, keep track of your timing or take notes while you present, the PowerPoint Presenter View gives you the flexibility. You see a special presenter view while your audience just sees your slides. 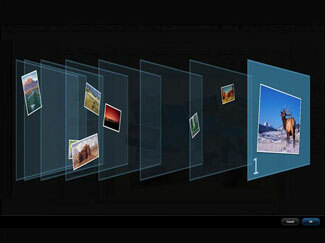 With Broadcast Slide Show your audience doesn’t have to be in the room. You can publish your slideshow to a unique web address and then present your slideshow in real time. You’re in control the whole time, moving slides forward as you speak. There’s no support for audio or video. Touch up your photos, remove backgrounds and add color filters right within PowerPoint. Looking to layer some text on top of a photo or two photos? See your document as a series of layers from the side for easy reordering. Make your spreadsheet easy to read using tables with icons, borders, solid colors, and negative values, as well as pre-packaged choices for formatting and filtering, including “Top 10,” “Bottom 10%” and “Text That Contains”. Excel for Mac finally supports pivot tables (if you know what pivot tables are, you know how important this feature is) and adds Sparklines, thumbnail-sized charts the enables you to easily view trends across a large amount of data. This means the new Excel is truly compatible with documents created in Windows. The program also incredibly fast, crunching data almost instantaneously compared to examples where Excel 2008 took nearly 20 seconds. For the first time Outlook is replacing Entourage as the unified program for managing email, contacts, calendar and notes. This first generation program is missing some key enhancements that come with Office 2010, including Social Connector, a useful tool that shows a sender's social networking updates, as well as related email and appointments, and syncs contact information from LinkedIn. 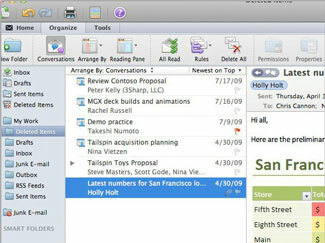 Outlook for Mac 2011 also doesn't sync with Google contacts or calendar—a major gap versus the Windows versions. Instead of searching through your inbox for all the threads of a conversation, you can choose to view them stored under the most recent message, freeing up visual space in your inbox space. Instead of hopping between inboxes for your work and home email, they’re consolidated into a single folder, and can also be viewed separately. On a Windows PC, your .pst file contains all of your Outlook data. 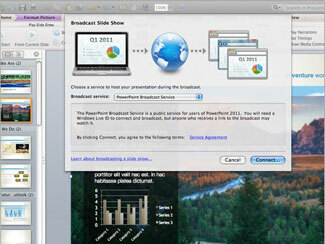 Now you can simple open that file on your Mac to import all of your data and you’ll be ready to go. One benefit of the Mac version of Outlook is that emails are stored as individual files for faster Time Machine backups. Microsoft Office for Mac 2011 Home and Student ($119 single, $149 Family with 3 Macs) includes Word, Excel, PowerPoint and Messenger. 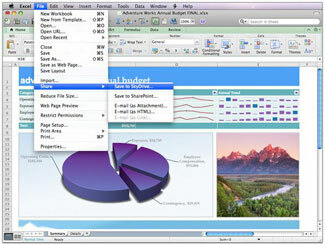 Microsoft Office for Mac 2011 Home and Business 2011 ($199 single, $279 for 2 machines) offer all the programs in the Home and Student version as well as Outlook. Typo-5th paragraph “You’ll know if you company needs one” should be changed to “You’ll know if your company needs one”. does anybody know if there will be an add on to sync outlook’s calendar with google calendar (or iCal) ? @James Thanks for pointing out the typo. @Justin The Microsoft folks I spoke to last night weren’t able to provide any information on when a sync app may be available (I really don’t think they knew). But it certainly is a glaring omission.